These easy pumpkin scones are excellent with a nice hot cup of coffee on a brisk Autumn morning. Snuggle up in your PJ’s and nibble on these fun treats! They really do melt in your mouth. Ever since I started this site people have been telling me I haven’t done a pumpkin scones recipe yet. And I was reminded of this watching a TV series the other day when the macho farmer who stars in this new show was making pumpkin scones for a competition at the local community hall! As if! The local ladies were really in for a treat! Anyway, I think mine are better than his. He didn’t win the competition, not surprising really as his classic pumpkin scones looked rather burned. 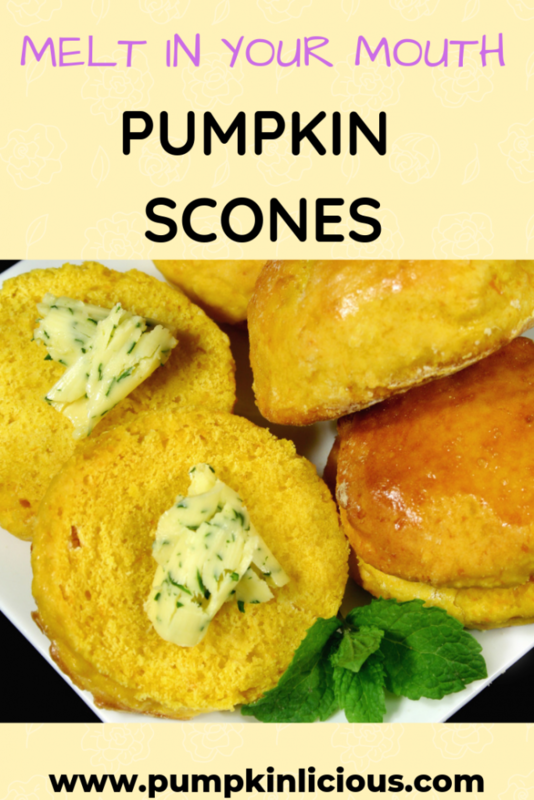 This is how to make really easy quick pumpkin scones, not for a competition, but for a yummy afternoon treat. If you are short of time you do know that you can freeze unbaked scones and get back to baking them at a later stage when you have more time. Enjoy with your morning coffee or tea! Delicious and sweet! Some people will tell you to steam the pumpkin then put it in the oven to dry. I just cooked a quarter of a large kent pumpkin (you can use any nice sweet variety) in the oven when I did a roast. It's good to do the day before because then you can cool it in the fridge. Either way, make sure it's cool before you use it. Mash with a fork, or mix in the blender until smooth. You could also use canned. First cream the butter and sugar together - by hand or in your blender. Beat in the egg and the cold pumpkin mash. Then sift in the flour and blend until it forms a dough. If it's too dry mix in a little milk. I found it was too wet and I added more flour. Knead the dough on a floured board then flatten out to about 2 cms thick. Cut with a 5cm cutter into scone shapes and spread on a baking tray on greaseproof paper. Place in the oven for about 10 - 12 minutes or until golden brown. Break in half and serve with butter. If you're a pumpkin spice fan, add a 1/2 teaspoon each of ground ginger and ground cinnamon to the flour before you add it. And, if you're a fan of Starbucks Pumpkin Scones, which I believe are rather popular, add the spices and make an icing adding a little cinnamon, and there you have your own at home. How about a fruity twist? You can add blueberries, cranberries, raisins or even nuts on top for that extra burst of flavour. Orange and chocolate also work well with pumpkin. A heated scone with lots of butter and a hot drink is the perfect comfort food on a cold windy afternoon. I like to make them for my friends if they are coming over for a catch -up. You can also add some butter with herbs for extra flavor. If you are feeling really indulgent why not add some cream cheese spread?! This tastes so good with keto pumpkin cupcakes, breads and muffins. 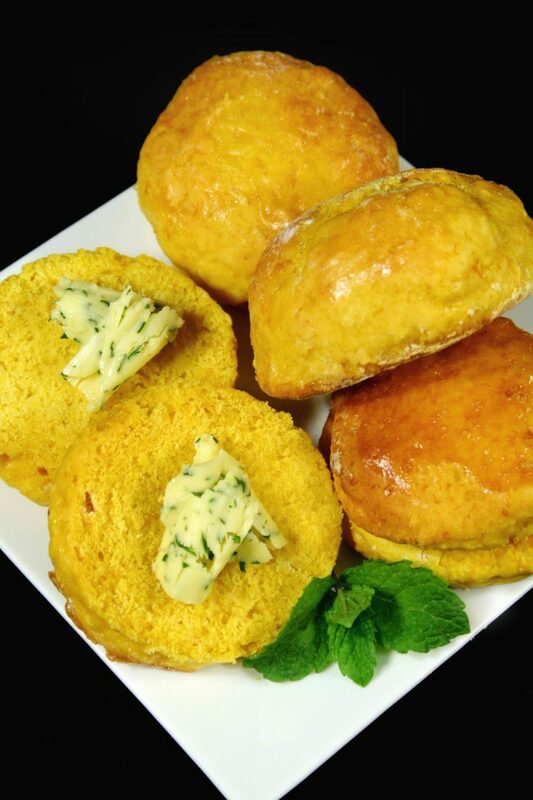 What variety of scones do you prefer? Perhaps you would like to try them all before answering!